A dental crown is a reliable way of restoring a badly broken tooth. The most common material used for these restorations is reinforced porcelain or a combination of porcelain and metal. Porcelain is a strong, robust material that can provide more protection for a weak tooth than a standard white composite filling. We recommend a crown for any root canal treated back tooth to protect it. Back teeth are your main chewing teeth, so they take a lot of repeated force during your lifetime. If one of these teeth has the nerve removed (a root canal procedure), they then become intrinsically very weak, and are at high risk for breaking. By reinforcing these teeth with a crown, they are protected against further damage from biting forces and will ensure a longer lifespan for that tooth. 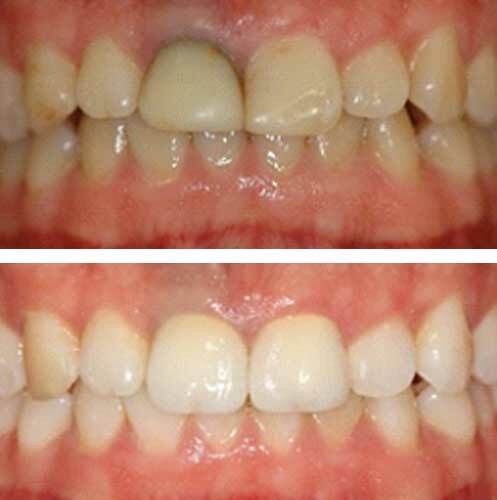 Tooth coloured porcelain crowns can be a great way to improve your smile. At Ivory Dental Care in Malahide we use the most up to date and modern materials to achieve a natural looking result. As crowns require some preparation of your own teeth we would always explore other, less invasive options such as teeth whitening, porcelain fillings or cosmetic bonding at your consultation appointment.